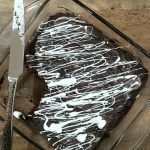 Extra Fudgy Dark and White Chocolate Zebra Brownies are so fudgy and decadent with only a handful of ingredients. You’ll love the white chocolate drizzle over the deep dark chocolate brownie. I called these Zebra Brownies for obvious reasons. 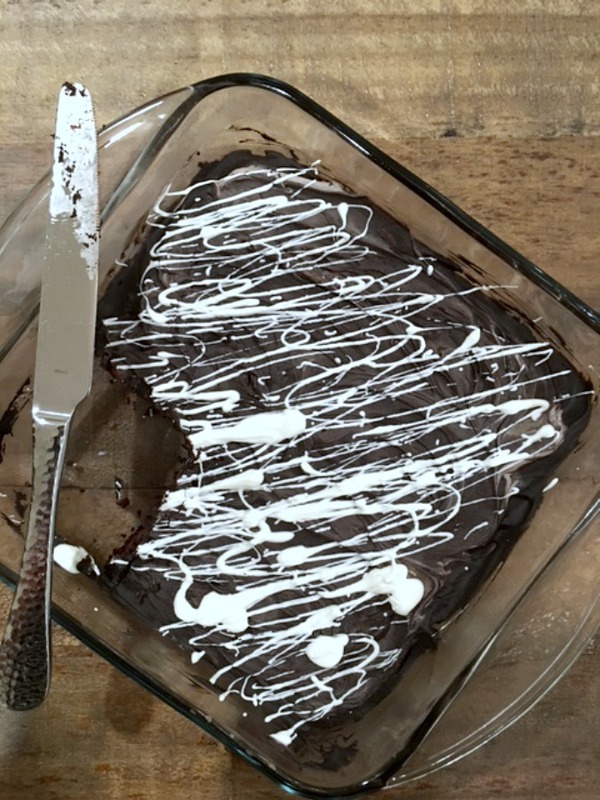 The white chocolate drizzle adds a great contrast against the dark chocolate. The taste combo is out of this world delicious. 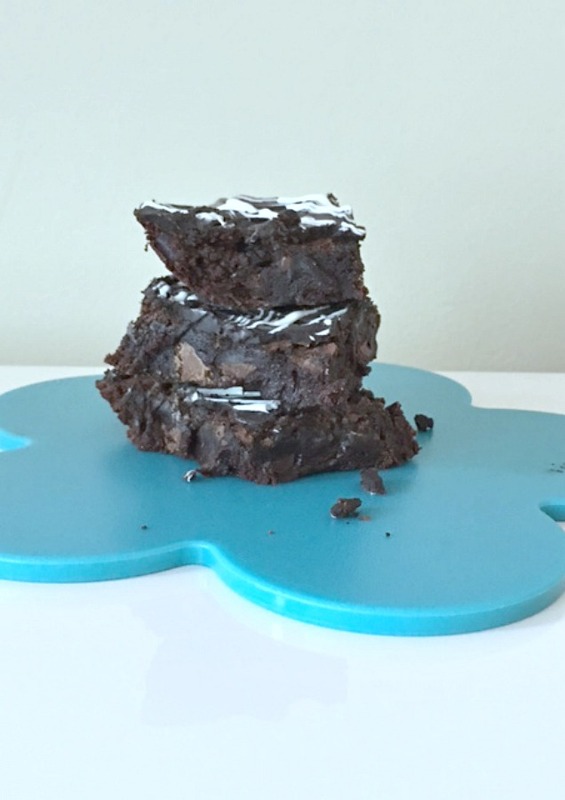 Bake a batch today, see how easy this recipe is using a brownie mix while still having these taste homemade by just adding a few ingredients. Preheat oven to 350 degrees, spray a 9 X 9 inch square pan with baking or cooking spray. Set aside. In a large mixing bowl, pour dry mix in. Whisk to break up any clumps. In a measuring cup or medium bowl, combine oil, syrup, water, egg, and extract. Mix with a fork to combine. Pour into dry mix. Using a rubber spatula, combine well. Make sure you dig to the bottom of bowl to combine all dry mix into wet. Add chocolate chips and candy bar. Gently mix in. Pour batter into prepared pan. Bake for about 25 -30 minutes or until a toothpick comes out with dry to moist crumbs. Try not to over bake. Let cool completely. Melt white chocolate in a microwave safe measuring cup for 3o seconds. Take out, stir, put back in for another 20 seconds. Stir well to combine. If needed, place back in microwave for another 15 seconds. Stir until smooth and completely melted. Pour from measuring cup onto brownies to make “Zebra” stripes. Let white chocolate set up. 1.Preheat oven to 350 degrees, spray a 9 X 9 inch square pan with baking or cooking spray. Set aside. 2.In a large mixing bowl, pour dry mix in. Whisk to break up any clumps. 3.In a measuring cup or medium bowl, combine oil, syrup, water, egg, and extract. Mix with a fork to combine. 4.Pour into dry mix. Using a rubber spatula, combine well. Make sure you dig to the bottom of bowl to combine all dry mix into wet. 5.Add chocolate chips and candy bar. Gently mix in. 6.Pour batter into prepared pan. Bake for about 25 -30 minutes or until a toothpick comes out with dry to moist crumbs. Try not to over bake. 7.Let cool completely. 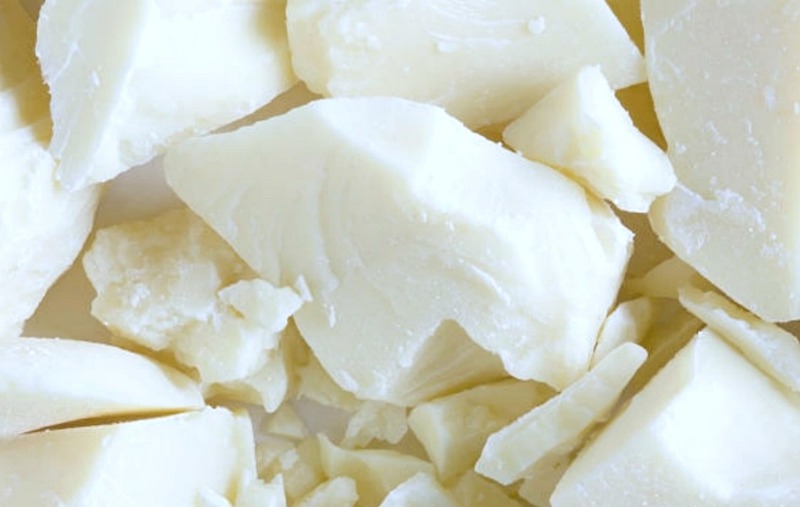 Melt white chocolate in a microwave safe measuring cup for 3o seconds. Take out, stir, put back in for another 20 seconds. Stir well to combine. If needed, place back in microwave for another 15 seconds. Stir until smooth and completely melted. Pour from measuring cup onto brownies to make “Zebra” stripes. Let white chocolate set up.